Many additions and enhancements to its suite of end-to-end video surveillance offerings will be presented. Valerus 19: The latest update to Vicon’s popular VMS software provides mapping and event management. Valerus Security Console: Vicon’s new all-in-one security and operations workstation, it can be used as a central control station for a combined security console and business desk. This high-powered console places the capabilities of Vicon’s integrated security suite, featuring Valerus VMS and VAX Access Control, literally at your fingertips. With three 24-in. high-resolution touch-screen displays, this multi-functional work console eliminates cluttered desks and improves operational efficiency like no other workstation. IP Cameras with Edge Analytics: Vicon’s broad line of ONVIF cameras now includes models that offer extensive edge analytics built into the camera. VAX Mobile Credentials: Vicon’s series of contactless smartcard readers with mobile access support offers a new level of convenience for Vicon Access Control (VAX) customers who prefer to use their smartphones (iPhone or Android) instead of cards or fobs. “Vicon will be showcasing our many new products and product enhancements at ISC West this year. We are very excited to introduce the Valerus Security Console, the industry-first security and operations console offers an all-in-one ergonomic workstation with unmatched flexibility for today’s multi-tasking IT Security workforce,” said Bret McGowan, Senior V.P. of Sales and Marketing. Visit Vicon in Las Vegas at ISC West, Venetian/Bellini Meeting Room 2106, April 10-11, 2019. Learn more now by visiting Vicon’s website at: http://www.vicon-security.com. 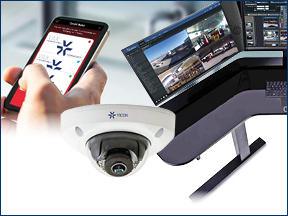 Vicon's latest end-to-end video surveillance offerings will be presented at ISC West.